The day may not be far off when the death penalty is finally abolished in the United States. This optimism is based on a continuing drop in executions, a shrinking number of death sentences handed down each year, and opinion polls that show growing opposition among the public for the use of the death penalty. Such an outcome—whether from a Supreme Court ruling outlawing capital punishment or all 50 states enacting bans—would be the result of a variety of factors, including a concentrated effort over many years by Atlantic and other donors to support the work of advocates who have campaigned, lobbied, and pursued legal action in their quest to abolish the death penalty. The work appears to be paying off. A recent independent evaluation by Kay Sherwood and Michael Quinn Patton commissioned by Atlantic found that the foundation’s efforts contributed to what they call “the momentum” toward abolition. Atlantic’s role in this work began in 2004 and ended 11 years later. During this period, the foundation invested nearly $60 million. Although the decision to take on this work came relatively late in Atlantic’s life—2004 was only 12 years before the foundation would conclude its grantmaking—the board, staff, and leadership saw it as an opportunity worth pursuing. In Roper v. Simmons, the Supreme Court ruled that executing individuals who committed crimes as minors violated the Eighth Amendment’s provision against cruel and unusual punishment. The foundation had begun to explore the death penalty in the context of its work to protect what it referred to in a 2003 memo to the board of directors as “basically accepted human rights principles.” Up until then, most of Atlantic’s reconciliation and human rights grantmaking had occurred in Northern Ireland and South Africa. In creating a formal Reconciliation & Human Rights program, and making the death penalty a focus of this work in the United States, Atlantic felt that ending capital punishment would address a fundamental violation of basic human rights. Atlantic also believed that by supporting the work of advocates, there was a very real possibility of reducing or eliminating the use of the death penalty during the remaining years of the foundation’s life. As a first effort, the U.S. Reconciliation & Human Rights Program, which was at the time led by Rebecca Rittgers, decided to lend support to groups trying to end the juvenile death penalty. While there was little dispute that imposition of the death penalty at any age is a major violation of human rights, at that time staff felt that anti–juvenile death penalty advocates were close to achieving a big victory. Moreover, only a relatively limited amount of funding would be required to get behind an aggressive strategy, and success or failure would likely be known in a short time frame. In seeking to abolish the death penalty, Atlantic felt it could make progress during its limited life in addressing a major human rights challenge. After the Court’s ruling in Roper, Atlantic staff engaged in a strategic process to decide what to do next. Several options were on the table—it could move on to a different issue; it could tackle the problem of over-incarceration of juveniles and the practice of sentencing juveniles to life in prison without parole; or it could use the victory in the Roper case to attempt to end the death penalty entirely. Those who favored taking on the adult death penalty said the Roper victory showed that in some quarters attitudes toward capital punishment were changing in the country, making this a ripe opportunity. In addition, given Atlantic’s limited budget and time horizon, it wouldn’t have to start fresh but could build on investments it had made in support of the Roper case. Staff acknowledged that it was not likely that the foundation would see the abolition of the death penalty before it closed its doors. But they were confident that Atlantic’s investments could push the movement to a point where it would build sufficient momentum toward ultimately achieving that goal. In 2005, Atlantic created a grantmaking strategy to end the death penalty completely. The foundation’s entrance into the field represented a major development. In particular, it was prepared to invest significantly, and at a far greater level than the $3 million annually coming from five existing anti–death penalty funders. Atlantic’s staff had confidence that its investments could push the abolition movement to a point where it would build sufficient momentum toward ultimately achieving that goal. While sensing opportunity, Atlantic also knew the challenges it faced. In 2005, 38 states permitted executions, courts handed down 139 death sentences, and 60 people were executed. Public opinion was also on the side of the executioners—two-thirds of Americans were in favor of the death penalty as a way of deterring crime and punishing the guilty. Of the states that permitted executions, only Illinois had a legal moratorium barring the use of the death penalty. Nevertheless, the field was small and the organizations that constituted it were significantly underfunded. While many death penalty attorneys represented individual clients, there was no coordinated strategy to get the Supreme Court to overturn the death penalty. To end the death penalty, states could pass laws ending the practice, they could simply stop using it, or the Supreme Court could strike it down as unconstitutional, ending the practice nationwide. Beginning in 2006, Atlantic joined with a number of other funders to design a coordinated campaign. The campaign was called Abolition2025* for several important reasons—first, it was an acknowledgment that culture shift takes time. Achieving abolition by 2025 also provided the field with a goal to work toward. By setting a clear time frame, the campaign could set priorities for its work, and it could compare and vet strategies for getting to the goal. Finally, it was an acknowledgment that the campaign would extend beyond the end of Atlantic’s life, and it provided an implicit encouragement to put a plan for sustainability in place. There are two ways to abolish the death penalty—states could pass laws ending the practice or simply stop using it; or the Supreme Court could strike it down as unconstitutional, which would end the practice in all states. While the program’s strategy was to push for reform at the state level, where policies and laws around the death penalty are set, Atlantic staff knew that success in ending or lessening the use of the death penalty around the country could also influence the Supreme Court’s thinking on the practice. While many in the anti–death penalty community preferred forcing the Supreme Court to decide, they recognized that the cost of failure would be high. A loss in the Supreme Court would represent a significant setback for the movement. However, should the Supreme Court determine that the death penalty was unconstitutional under the Eighth Amendment’s prohibition of cruel and unusual punishment, it would settle the question for good. For the Supreme Court to abolish the death penalty, justices would need to be convinced that the “standards of decency” had evolved to the point that capital punishment for adults is considered cruel and unusual punishment. Atlantic and its partners also understood that it would only make sense to bring a Supreme Court case if the conditions on the Court were optimal. Given the nature of the Court, and the fact that it’s impossible to predict when the justices might agree to take up a case, they accepted the fact that achieving such a victory could take many years, and perhaps not before 2025. What they could control, however, was achieving victories on the indicators that the Supreme Court would take into account if and when it agreed to hear a case. Since 2004, seven states have repealed their death penalty laws and four states have issued moratoria against it—more proof that the standards of decency are evolving. All groups working toward abolition also agreed that for the Supreme Court to vote to abolish the death penalty, a majority of justices would need to be convinced—similarly as they had in Roper v. Simmons—that the “standards of decency” had evolved to the point that capital punishment for adults also is cruel and unusual punishment and prohibited by the Eighth Amendment. The grantmaking strategy to abolish the death penalty supported policy advocacy, outreach and organizing, litigation, and electoral activities. A strong and focused communication strategy has also been very important to the national abolition campaign. The messages that national information campaigns have been using highlight the flaws with the country’s death penalty system: it’s expensive, it disproportionately affects low-income people and people of color, innocent people are being put to death, and it does not deter crime, among other messages. Moreover, it is unevenly applied—a mere 2 percent of the country’s counties issue 50 percent of the death sentences. The ultimate hope is that as more people understand the truth about the death penalty, growing numbers will conclude that it serves no useful purpose. Those messages have been resonating with state governors and legislatures. Since 2004, seven states have repealed their death penalty laws and four states have issued moratoria against the death penalty. Other evidence that the anti-death penalty message is being received nationwide can be seen in polls over the years that show a steadily declining drop in public support. For instance, a 2016 poll conducted by the Pew Research Center shows that the share of Americans supporting the death penalty had fallen to its lowest levels in more than 45 years, dropping below 50 percent for the first time since 1971. While such a dip in public opinion would be important in a future Supreme Court case, justices take other factors into account as well. In Eighth Amendment cases, the Court has paid particular atention to whether juries impose the death penalty and how elected lawmakers vote on legislation to limit or abolish the death penalty. Advocates understand the value of credible messengers and have worked closely with a wide variety of partners. These include evangelicals and conservatives who say the death penalty is ineffective, wasteful, and unjust; victims’ families, who say that the death penalty process prevents families from achieving closure and argue that the money saved by closing death row could be beter spent for victims’ services or to reopen cold cases; and exonerees, who are living proof of the failure of the system to properly determine guilt. When states outlaw the death penalty, they are indicating that it is no longer considered an acceptable form of punishment—more proof that the standards of decency are evolving. Because getting states to repeal the death penalty is an inherently political process that involves advocating for specific policies, Atlantic felt that the most effective route to policy change would require aggressive advocacy efforts that included direct lobbying. The foundation was able to make grants through its Atlantic Advocacy Fund, a 501(c)(4) organization that can support ballot initiatives, direct lobbying, and other activities. Many private endowed foundations do not have a 501(c)(4) funding arm and thus Atlantic’s role proved to be extremely valuable. A 2016 Pew Research Center poll found that the share of Americans supporting the death penalty had fallen to its lowest levels in more than 45 years. Juries deciding not to impose death sentences could indicate to the Supreme Court that, as maturing society, growing numbers of people no longer believe execution serves any benefit. Similarly, when states decide not to carry out executions, they are demonstrating their discomfort about killing people. Atlantic determined that the most effective approach to achieving a reduction in death sentences was to provide funding for litigation in capital cases. In some instances, that money paid for lawyers to mount vigorous defenses for individuals on trial for their lives, while on other occasions the funds were used to bring court cases challenging the legality of lethal injections. As Rittgers had observed in 2004, Atlantic had an opportunity to make a large investment in ending the death penalty. Over 11 years, the foundation would ultimately invest $60 million toward this effort, or roughly 60 percent of all funding for death penalty abolition during this period. By the time Atlantic joined the effort, organizations were beginning to have success, even though the work had never been well-funded. The conditions were excellent for a grantmaking strategy to make a difference—especially one with a national focus. At the time Atlantic began working on the death penalty, most activity was taking place on the local level. That included litigating individual death penalty cases and undertaking grassroots advocacy to end capital punishment in specific states. None of this work was coordinated and there was very little interaction among national advocates, grassroots groups, and litigators. There was no collaborative funding process either, and the combined $3 million annual funding was a small sum relative to the task. Abolition2025 set out to change that. The campaign established a national steering committee and a national campaign coordinator, and it funded national anchor organizations, including Equal Justice USA and the National Coalition to Abolish the Death Penalty. It also convened regular meetings and conferences to bring together all aspects of the abolition movement to develop a national strategy, which was in effect a state-by-state strategy, and to share best practices. The funders included: The Atlantic Philanthropies; Butler Family Foundation; Fund for Nonviolence; Open Society Foundations; The Anonymous Fund and the Death Penalty Mobilization Fund (both housed at Tides Foundation); and the Wallace Global Fund. * They established a group called Funders for Alternatives to the Death Penalty and agreed to coordinate funding in support of the strategy. Applicants would submit an annual single letter of inquiry to the Funders for Alternatives to the Death Penalty, which focused grantmaking and streamlined paperwork. The grantmaking strategy also included funding for the necessary legal work to bring a good case, including monitoring the courts to identify possible cases and supporting friend of the court briefs from a variety of sources. With Abolition2025 fully in place, there was now a process to launch a national campaign and a steering committee made up of grantees who worked together to create a national strategy document for the movement. This in turn helped donors make informed, coordinated decisions about how to make grants, and helped organize the work. At the time Atlantic began working on the death penalty, most activity was taking place on the local level. But the conditions were excellent for a grantmaking strategy to make a difference— especially one with a national focus. Over the course of the campaign, advocates made a great deal of progress. Since 2005, the death penalty has been ended in 11 states through legislative bans, court rulings, or gubernatorial moratoria. In addition to pushing for abolition in states that did not regularly use the death penalty, the campaign achieved progress in other places around the country still issuing or carrying out death sentences. For example, the number of death sentences imposed fell from 140 in 2005 to 30 in 2016. The statistics around executions are a little more complicated. After a low of 37 in 2008, they spiked to 52 in 2009 and then began coming back down again steadily, to 20 in 2016. The drops in death sentences and executions largely resulted from support to public interest law firms whose lawyers were able to mount effective defenses. Executions were also prevented by lethal injection court challenges that rendered some state lethal injection protocols invalid and prevented some states from obtaining execution drugs. Their work especially paid off in states such as Alabama, Arizona, Georgia, and Texas, which were prone to handing down death sentences and carrying out executions. Advocates understand the value of credible messengers and have worked closely with a wide variety of partners. The national strategy to move broad public understanding about the death penalty went hand in hand with state-by-state campaigns. As states succeeded in overturning death penalty laws, it provided important momentum to push for others to act. This also advanced the constitutional argument that the standards of decency were evolving. • New Mexico public opinion supports this approach. • Keeping the death penalty means risking a wrongful execution. • The death penalty costs too much. • The world is watching. • Abolishing the death penalty actually helps the families of murder victims. Their campaign was directly targeted at the legislature, with a goal of passing a bill that would repeal the state’s use of the death penalty. In advance of the 2009 legislative session, death penalty opponents held events across the state at schools, churches, nonprofit organizations, and elsewhere to prepare participants for an Advocacy Day in the state capital. On that day, advocates fanned out across the capital, meeting with elected officials, holding press conferences, and making their voices heard. Governor Bill Richardson, who had previously supported the death penalty, was persuaded to sign a repeal bill, citing many of the arguments put forward by the Coalition. Media outreach included national and international television, print, and radio interviews. It even included a play about the case of a death row inmate who had been exonerated that had been commissioned for the purpose of highlighting the injustice of the death penalty. The intense lobbying paid off, and the New Mexico House and Senate sent a repeal bill to the desk of Governor Bill Richardson, who had previously stated his support for the death penalty. He was persuaded to sign the bill, citing many of the arguments put forward by the Coalition. • Only 30 death sentences were handed down, the fewest since the reinstatement of the death penalty in 1976. • States carried out the fewest number of executions (20) in 24 years. • Five states performed executions—the smallest number in 25 years—and down from 16 in 2005. A 2016 Washington Post/ABC news poll on the death penalty found for the first time that a majority of Americans favored life imprisonment without parole instead of the death penalty when offered those two choices (52 percent vs. 42 percent). In addition, 19 states did not have the death penalty. New Jersey, New Mexico, Illinois, Connecticut, and Maryland abolished the death penalty through their legislatures in 2007, 2009, 2011, 2012, and 2013, respectively; and laws permitting the death penalty were ruled unconstitutional by the high courts of New York in 2007 and Delaware in 2016. Although 31 states still retain the death penalty, only five of them actually carried out executions in 2016. In addition, 11 states, the U.S. Federal Government, and the U.S. Military currently are de facto abolitionist by U.N. standards, which means they haven’t carried out executions in over 10 years. Although 31 states still retain the death penalty, only five of them actually carried out executions in 2016. The funding landscape continues to evolve. In 2016, the Themis Fund, which had taken over for the Funders for Alternatives to the Death Penalty several years earlier, concluded its work. Responsibility for funder coordination and fundraising shifted to the 8th Amendment Project. Like Themis before it, the 8th Amendment Project is an initiative of the Proteus Fund. 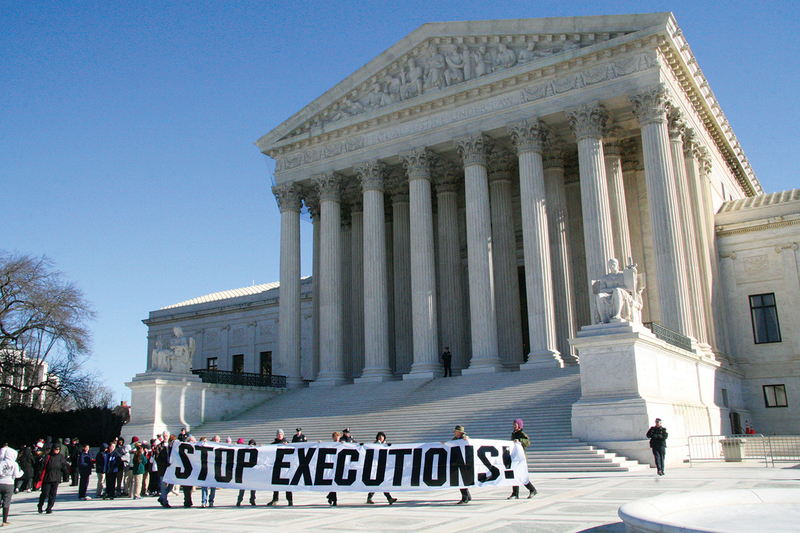 To achieve the goal of getting the Supreme Court to ban the death penalty in the United States, the 8th Amendment Project sets the national abolition strategy and works to ensure that groups carrying out its various elements— advancing abolition research, raising issues of legal system accountability, repealing or restricting state death penalty laws, and helping with capital defense efforts— do so in a coordinated fashion. Atlantic placed a high priority on ensuring that grantees have reliable, institutional support to carry out their work. This kind of funding pays for staffing, materials, and other campaign-related costs that can be very hard to come by. Commitment to advocacy. Much of Atlantic’s funding came in the form of 501(c)(4) grants. This money can be explicitly used for lobbying and other political activities, including drafting legislation, persuading legislators to introduce legislation, and sharing lobbying materials to help pass or defeat legislation, among other activities. While 501(c)(3) organizations can engage in certain kinds of lobbying, (c)(4) money is considered far less restrictive. Here, Atlantic was able to fund political advocacy activities in ways that other private foundations were not. Co-funder. Atlantic was an active collaborator with a group of funders who worked together to create a coherent funding strategy. In addition to making grants that other funders are less likely to make, Atlantic worked with other funders to advance cooperation and communication among the group, and to ensure that each funder had an important role to play. Much of Atlantic’s funding came in the form of 501(c)(4) grants—money that can be explicitly used for lobbying and other political activities. Strategy coordinator. There were a number of occasions when it became clear that a robust, coordinated strategy was needed. In 2007 and then again in 2013, it became necessary to call for a cohesive vision to guide the work. While the strategy development was a collaboration of funders and practitioners, Atlantic wanted to make sure that the strategy was developed and implemented cooperatively. There was no consensus, however, about who was best suited to shape the death penalty strategy. Some advocates became concerned that the field was fracturing and that funders could help maintain discipline, while others would have preferred funders to leave more decision-making to the field. It remains to be seen whether this approach, which was shaped by the funding community, will prove to have been effective. Some of the greatest challenges occurred when there was a lack of clarity around particular goals and the strategies to achieve them. Nevertheless, the field has been able to organize around a common campaign approach, pushed by funders and advocates alike. In the past decade, the death penalty abolition movement has achieved a great deal of success. Given that the campaign’s initial target was to end the practice by 2025, it’s reasonable to conclude that the work is ahead of schedule. The role of advocacy and effective communications cannot be overstated. Advocates have conducted a comprehensive campaign to conduct vocal grassroots organizing to put pressure on legislators, they have designed smart communications to highlight the issue, and they have delivered politically savvy approaches to identifying audiences and creating messages that speak to their audience’s values—invariably delivered by credible messengers.